What puts people at risk of dementia? Can I reduce my risk of dementia? Aside from any medicines a person with dementia may be able to take, there are other ways they can stay healthy, engaged and safe. This section has information on physical activity, psychological support, the physical environment, and complementary therapies. For a person with dementia, there are many benefits to staying physically and socially active. Seeing people socially and staying involved can help to stop people becoming isolated and depressed. Regular exercise can help to keep them fit, but may also help them to form good sleeping habits so they – and their carers – are more rested. Click on the lines below to expand them and read more information. There are many options for activities for people with dementia: from just helping around the house or with shopping, to going out to a regular club. While able, it’s great if they can keep up an activity or sport that they’ve always taken part in, such as bowls or going walking. Group activities are even better. They will get exercise and social contact at the same time. For those less fit or less mobile, there are even seated exercises they can try. We know that meeting people and reminiscing about the past or talking about what’s going on around them can help people with dementia with their memory and communication. Even for people with more advanced dementia, being around people and included can help them to feel involved and they will be more likely to interact with others. While staying physically and socially active can be beneficial, it’s important not to force it on a person with dementia. In spite of the condition, they remain who they always have been. So, if your loved one has always been introverted, you’ll need to balance the benefits of social activity with the fact they may find it quite distressing to suddenly change their social habits. There are lots of reasons why it’s important for someone with dementia to stay socially active and involved. Seeing people and getting out and about may help to prevent them becoming isolated and help to combat depression. Taking part in activities with other people can help them to maintain their ability to interact and communicate. Planning activities for the evening that they enjoy can stop people from wanting to go to bed too early and so can help with sleep problems. If you’re a carer, try to think of activities that your loved one is likely to enjoy and that they’re able to do. Think of these as active treatment. It isn’t uncommon for people with dementia to show a lack of interest or motivation, so you may have to persist. But anything you can get them involved in, however small, will be helping them. For people with advanced dementia, it’s important for them to be included at family events, for example, so that they feel involved even if they can’t participate very much. We know that chatting, reminiscing about past events and discussing what’s going on in the world can help to maintain memory and communication. There are a few options for organised activities where people with dementia can meet others. This has the added benefit of giving dementia carers a short break. There may be local lunch clubs, memory or reminiscence groups at memory clinics or day care available in your area. Ask at your local library or look at our section on support available for organisations to contact. NICE recommends that physical exercise should always be part of dementia care. There is research evidence showing that exercise may improve the ability of a person with dementia to perform activities of daily living. These are routine tasks necessary for looking after yourself, such as washing, dressing and going to the toilet. Regular exercise can also help with regulating sleep patterns, which can be disrupted in dementia. Exercise may also help to combat depression. For those reasons alone, it’s important that carers feel confident about encouraging exercise as part of their loved one's dementia treatment. Staying as independent as possible for as long as possible will mean that a person with dementia will have a better quality of life. In turn, this will reduce the load for you if you’re a carer. There is even evidence from one trial that dementia carers find it easier to cope if they supervise exercise or join in! There is information in this section about exercises for people with dementia, but there are other less formal ways of keeping physically active. Helping with housework, doing a bit of gardening or walking round the shops are all forms of exercise. If you’re a busy carer, it may be hard to encourage your loved one to help make the bed, when it might be quicker to do it yourself. Thinking of these things as dementia therapy for your loved one may help. Regular exercise is good for all of us – helping to maintain heart health, reduce risk of stroke, lower risk of some cancers and combat stress. So building some activity into your day will help you both to stay as well as possible. For people of any age, it’s important not to overdo it when starting to exercise. If a person with dementia has any other health conditions, their GP should be consulted before they start any exercise. If the person is still able to enjoy activities and sports they’ve always enjoyed, there’s no reason why they shouldn’t carry on. Activities such as bowling, swimming and dancing are fun, very good for you and often very sociable. Physiotherapists recommend starting with only 10 minutes a day if there’s any stiffness or restricted movement. The person can then aim to build up to 30 minutes a day if possible. This can be broken up into three lots of 10 minutes. Remember, this doesn’t just have to be sports or formal exercises. Exercise for people with dementia can include housework, gardening or walking to the shops, for instance. If the person with dementia is less mobile, there are seated exercises they can do. These may be more fun if there’s some music playing while they do them. If you’re a carer, here are a few ideas for some seated exercises your loved one could do. We have more tips about Helping your loved one stay healthy. For someone who’s been diagnosed with dementia, psychological support is very important. Many people find it difficult to come to terms with their diagnosis. Depression and anxiety are common in people with dementia. There are therapies that have been shown to be helpful for people with dementia. Some provide simple strategies and techniques that are easy to learn and practice at home. They may help you and the person to feel less stressed and make the most of life. Carers of people with dementia may also need psychological support. You can find out more about this in our section on living well as a carer. If someone has dementia, there may be times when they need more support than relatives and friends can provide. Someone who’s been diagnosed recently may find it helpful to have counselling, either on their own or in a group. There may be local dementia support groups in memory clinics or community organisations. Admiral Nurses are nurses who specialise in the care and support of people with dementia. They can listen to how someone is feeling and give them a chance to talk. Doctors should consider cognitive behavioural therapy (CBT) as part of treatment for people with early dementia. It can help with depression and anxiety. CBT is a way of re-learning behaviour that has become a habit. In very simple terms, it comes down to ‘stop, think and do differently’. So someone who has dementia symptoms may keep having negative thoughts that are upsetting. With CBT they can learn to become aware of when they’re doing this, stop themselves, and try to think calming thoughts instead. Of course, this takes practice, and they may need the support of their loved ones. But research into CBT has shown that people with dementia can successfully learn these new skills. Carers can also benefit from CBT. There is more about this in our page on Carers looking after themselves. Cognitive stimulation is a technical way of saying ‘mental exercise’. It refers to a range of social and mental activities that are meant to be enjoyable and are aimed at improving thinking, concentration and memory. This can include reminiscence – encouraging people to think and talk about the past. There is consistent research evidence that this can help to improve thinking and understanding for people with mild-to-moderate dementia. So, doing word games, puzzles, talking about interests and even practical activities such as baking and gardening can have a positive effect on memory and quality of life. These activities can also help to improve communication and social skills. It’s not surprising that this type of dementia therapy can help. It is in line with the general view that our mental abilities are more likely to decline if we don’t get enough mental stimulation. If you’re caring for a person with dementia, it’s encouraging to know that activities and pastimes you organise for your loved one are helpful and could effectively be part of their dementia treatment. If you’re looking for day-care services or groups for a person with dementia, try to find one that offers this type of therapy. They may not call it ‘cognitive stimulation’, but if they’re arranging enjoyable activities that stimulate thinking and encourage people to interact, it’s of proven benefit. Mindfulness means paying attention to the present moment and trying to accept things the way they are. It developed out of meditative practices, and is meant to improve mood and help you to generally feel more positive about life. Mindfulness has been tested in people with dementia and their carers. In one study, they were taught mindfulness techniques and then practised them for up to an hour a day. Mindfulness isn’t difficult – it just takes a bit of practice. If you’re caring for someone with dementia, you might find it something relaxing and enjoyable to do with your loved one. Taking part as a carer may well have benefits for you and may also help you to encourage your loved one to keep it up. Find out more about mindfulness. Being able to live safely at home can mean people with dementia can be independent for longer. Safety is also a source of worry for you if you’re a carer. A person with dementia may not recognise signs of danger, such as a slippery floor, the smell of smoke or a bath that’s too hot. Their dementia symptoms may find it more difficult to find their way around and may make them more prone to falls. There are a lot of helpful devices on the market that you can buy, or get through local services such as occupational therapy. But there are quite a few relatively simple things you can do to make a home safer and easier for someone with dementia to cope with. This section has some ideas that you may find helpful, but they are just suggestions and won’t suit everyone. You know your loved one best so pick and choose what is most likely to work for them. There are some things that you can put in place throughout the home to make it easier to negotiate. The aim is to create an area that is bright, friendly and easy to manage. Ideally, people with dementia need to be involved with what’s going on around them. So, their main seating area should be in the heart of the home if possible. Lighting is very important. Having rooms well-lit will help people to move around freely and avoid bumping into furniture, for instance. Don’t overdo it though; if it’s too bright, this can cause restlessness. Keeping the hallway and bathroom lights on will help the person to find their way to the toilet during the night. A nightlight next to the bed will help them to find their way back again. Make sure stairwells are lit too. There are also automated lighting systems that you can install that will sense movement and switch lights on and off, but it’s worth trying cheaper options first. Signs can be helpful for a person with dementia. Again, don’t overdo it though, as too many might be more confusing. There are signs you can buy to help your loved one find their way around their home. For example, the sign for the toilet may have the appropriate word together with a drawing of a loo. If you don’t want to buy one, you can make things like this yourself; have them laminated and stick them to doors or walls. Pictures of what’s inside kitchen cupboards can be helpful too. Go for simple drawings of a cup, rather than a photo of the whole inside of the cupboard as that may be confusing. People with dementia may find contrasting colours easier to see. Patterns can also make things more difficult. They may think a patterned carpet is uneven and try to avoid it, making them more at risk of falls. Doors and door frames in contrasting colours will make moving around easier. A toilet seat in a contrasting colour can make using the loo easier too. Our information about Daily living has other ideas that you might find helpful about managing at home when you're caring for a person with dementia. Many older people are at risk of falls. A person with dementia may not always make complete sense of what’s around them. They may not see things as they really are, and this can increase risk of accidents. Here are some tips for making life less accident-prone. Get rid of as much clutter as you can, particularly on the floor. Fix down loose rugs and carpet edges. Look out for loose electric cords and move these out of the way or tack them down. Use non-slip flooring, particularly in the kitchen and bathroom. Keep items used regularly within easy reach. Make sure footwear fits properly – loose, flapping slippers, or ones without backs can be particularly dangerous. For ease of moving around, there should be clear routes through the house, between the living room and kitchen, or bedroom and bathroom, for example. You may need to move some furniture to make this possible, but try not to completely rearrange familiar rooms as this could be confusing. As people with dementia find it easier to see contrasting colours, it may help to paint or tape a bright contrasting colour on the edges of the stairs so the person can make it out. There may be places in the home where ramps or grab rails would be a help. You can arrange for an occupational therapist to do a home visit. They can advise you on adapting your home to provide the best dementia care for your loved one. If they agree that adaptations are needed, they can arrange for these to be fitted. Contact them through your GP. The kitchen and bathroom can be hazardous areas for people with dementia, but with a few small changes you can make them much safer. The first thing to check is the hot water temperature. If it’s too hot to keep your hand under comfortably, turn the main water temperature down. As with other rooms, make sure there isn’t clutter on the floor to trip over. Anything potentially poisonous should be hidden away. This includes cleaning products, bleach and medicines. A lockable medicine cupboard may be helpful. You may need to keep sharp knives out of the way too. If you think there’s a risk of the oven or hob being left on, you can have an isolation valve fitted to a gas cooker to prevent this. There are similar devices for electric ovens. Your utility company can give you information on these. Other devices can detect if a tap has been left running and shut it off. Devices like these can make providing dementia care much easier, so they may be worth the investment to install. Do make sure there is a heat alarm in the kitchen and that smoke alarms are fitted with working batteries. Your local fire service should offer free home safety checks and advice. If you qualify for them, they can supply and fit free smoke alarms, as well as advising on electrical safety and smoking safety. Getting in and out of the bath can be particularly troublesome for people with dementia. There are a variety of aids that help with this, such as bath boards or bath seats. You can buy these or get them from occupational therapy services, who can also arrange for a grab rail on the wall to help in getting out of the bath. There are simple electrical devices for lowering you into the bath that can be fairly easily installed, but these can be costly. If there is a separate shower, this may be safer than using the bath, particularly if there is room for a plastic chair to sit on while showering. If towels, soap, toilet paper and grab rails are in contrasting colours, they’ll be easier to see, and will help to orientate someone with dementia using the bathroom. Similarly, for crockery and cutlery in the kitchen. Lastly, it might be safer to remove or disable the bathroom door lock if there is any chance of someone getting locked in, particularly if they live alone. There is an ever-increasing array of technology that can be helpful when it comes to providing support and care for people with dementia. They’re generally designed to make life easier, but you have to know how to use them. Those based on mobile phones, computers or tablets may not be so easy for people with dementia who aren’t already familiar with these kinds of technology. There are alarm systems that people living alone can wear. Some have a button they press if they need help. Others automatically detect if the person has fallen. You can get information about these from your local Social Services department. Motion sensors installed in the home can trigger voice messages as reminders, or can make lights go on or off. A telephone with large buttons that can be pre-programmed can make it easier for someone with dementia to contact others. You can put a picture of the person on each button. There are many other devices and living aids available to make life easier for dementia carers. You can get more information from your local occupational therapy department or team of Admiral Nurses. Our page on Daily living has more tips about using technology to help you care for a person with dementia. A person with dementia may find spending some time outside and getting some fresh air good for morale and spirits. If they like spending time in the garden, having a look around for any potential hazards is time well spent. Here are some tips. Uneven paths or steps can increase risk of falling for people with dementia, particularly if there are any loose paving stones, so keep them in good order. Look out for any poisonous plants and remove them, just in case. Keep garden gates locked to stop the person walking off. Fence off ponds or streams or cover with netting. It’s not unusual for complementary and alternative therapies to be used in dementia care. This is partly because there’s currently a lack of effective medicines to treat dementia. Unfortunately, there are no complementary or alternative therapies that can cure or treat dementia. But some can be calming and help with symptoms such as agitation. Of course, people with dementia may also develop other illnesses that we all get from time to time, such as backache. As with anyone else, it may be worth exploring therapies such as massage and acupuncture to manage these ailments. People also turn to complementary therapies because having dementia, or being a carer for someone with dementia, can be stressful. So, if you are a carer don’t forget your own needs – a nice massage or some soothing aromatherapy may be just the relaxation you need. The difference between a complementary and alternative therapy is a little difficult to define. Simply put, a complementary therapy is one that you have alongside conventional medical treatment (the kind you get from your doctor or hospital). The therapist generally won’t claim to be able to cure or treat your medical condition. So this includes therapies like massage and aromatherapy. An alternative therapy generally claims to be able to cure or treat you instead of conventional medicine, often without the evidence to back that claim up. But it’s not always that straightforward. Acupuncture is often called an ‘alternative therapy’ but does have proven benefits for some illnesses, and quite a few ‘medical’ doctors are trained in its use. The National Institute for Health and Care Excellence (NICE) is the body that decides what treatments the NHS should fund in the UK. They do recommend some complementary therapies, including some of those listed here. Aromatherapists use essential oils from fragrant plants to improve your sense of wellbeing and help you relax. You may have a massage with the oils the therapist has chosen for you. Or the therapist may give you small bottles so you can put a few drops in your bath, or on to a fragrance diffuser or vaporiser. Aromatherapy is said to help promote sleep and relaxation and help with depression. Trials have been carried out trying aromatherapy for agitation, behaviour problems and to improve overall quality of life. The results were not consistent but NICE recommends that aromatherapy is one possible approach for treating agitation in dementia. Acupuncture uses very fine needles, which the practitioner puts through the skin in specific places and leaves in place for a short time. Sometimes, acupuncturists connect a small electric current that makes the needles tingle. Acupressure is similar, but uses pressure on acupuncture points, rather than needles. You normally have a course of these treatments. We don’t know exactly how acupuncture works. It is thought to have a number of different actions, on the nervous system, including encouraging the release of ‘natural painkillers’, endorphin and serotonin. In conventional medicine, it is mostly used to treat sickness (nausea and pain). Research into acupuncture as a treatment for mild cognitive impairment (which causes symptoms similar to dementia) has suggested it may help with thinking and memory. Other early research has suggested it might help in vascular dementia. It’s early days and we need more rigorous research as well as more research with patients with dementia. There is also research showing that acupressure can be helpful in controlling anxiety, although this research didn’t involve people with dementia. Massage means manipulation of the soft tissues (eg muscles) with the hands. Even though the evidence for it is not strong, massage is another complementary therapy that NICE recommends trying for someone with dementia who is agitated. There are many different types of massage. Hand massage was found in two clinical trials to reduce agitation in people with dementia. Gentle touch may also be helpful. Another study found that people with dementia ate more when their carers stroked their forearm gently while encouraging them to eat. There are various theories about why massage and touch may help people with dementia. One is that it releases oxytocin, a hormone that is calming and reassuring and so reduces agitation. Experts generally agree that the short-term benefits of massage are likely to be in improving behaviour and mood, and promoting wellbeing. More research is needed to form any strong evidence about the benefits of massage. Light therapy is a recognised treatment for a form of depression called ‘seasonal affective disorder’ (SAD). Light is thought to affect mood, behaviour and our internal biological clocks. Because of this, light therapy has been tried for people with dementia, mainly to try and correct sleep disorders, such as night-time waking and length of sleep at night. Unfortunately, a review of all the research didn’t show any benefit. However, if a person with dementia has always had low moods during the winter months, it may be beneficial. Light therapy is known to help around two-thirds of those with SAD. There are no real side effects, though in one study it may have caused agitation in some people with dementia. Light therapy involves sitting for 30–60 minutes in bright light once a day. This is brighter than normal light and special ‘SAD’ lamps are available. There are a lot of herbal therapies on the market these days. Several have been researched in dementia, including gingko biloba, vitamin E and a traditional Chinese medicine (TCM) called yizhi. None so far proved beneficial. St John’s Wort has been shown to be helpful for some people with mild or moderate depression, which can be common in dementia. Trying herbal medicines or TCM is not the same as trying something like music therapy. Most drugs come from plants originally and taking a herbal medicine is a bit like taking a drug in its raw form. Different brands can vary hugely in the amount of active ingredient they contain. They can also have side effects and may interact with other medicines you’re taking to produce very unpleasant effects. It’s very to check with the GP before a person with dementia starts to take any herbal or vitamin-based therapy. Some other approaches for agitation in dementia suggested by NICE are multi-sensory therapy and music or dance therapy. Multi-sensory therapy uses lighting, touch, calming music and essential oils. A review of the research didn’t show that it helped in the long term, but it may have a short-term benefit on mood for people with dementia. The review said we needed better research in assessing this type of therapy. Some researchers say that listening to music either on your own or in a group can help with behavioural problems. Music therapy also hasn’t been proved to be helpful in dementia, although there is a need for better research. Whether proven or not, it’s unlikely to do any harm and is worth a try, especially if the person with dementia is a music lover. Some people with dementia have access to pet or animal therapy. It may be arranged through residential care. This works on the idea that spending time with animals has a therapeutic effect. Western medical acupuncture: a definition. Acupuncture in Medicine 2009(27):33–35. Small, practical changes can make a big difference to everyday life when you are caring for someone with dementia. 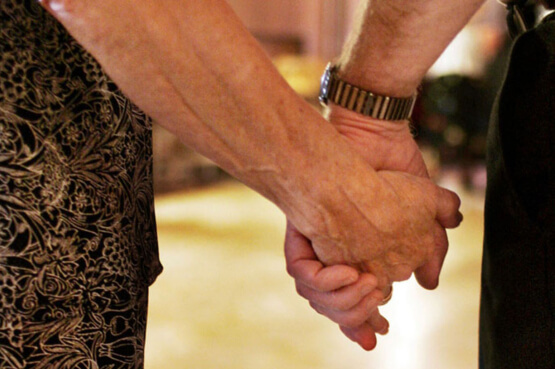 Making decisions about your loved one going into a care home can be very difficult. It can seem like a huge change in your relationship with each other. Our research tells us that, as well as good quality health information, people want to hear how others have dealt with similar situations. Share your story or tips with us.